According to The Tab, a Boston-area newspaper, Newton resident Tony Pagliuso was shocked when he examined a reading selection on the treatment of women in the Middle East his daughter brought home from her history class at Newton South High School. The article, from a controversial textbook called The Arab World Studies Notebook, falsely accused Israeli soldiers of murdering Arab women. Pagliuso was incensed to discover such defamatory material disseminated in his daugher's school and raised the issue with school officials. The incident prompts two critical questions that school systems need to address as they introduce the study of the modern Middle East to students: How do they identify reputable sources on such a contentious topic and what procedures do school systems need to put in place to evaluate curricular material supplied to them. Regrettably, some of the most prominent academic institutions educators turn to for training and curricula offer dubious scholarship tainted by partisan ideological agendas. Boston-area educators seeking guidance have logically turned to Harvard, one of the world's great universities. Teachers from Newton, Brookline, Canton, Harvard, Sudbury and Hingham public schools and Brimmer May and Beaver Country Day private schools have attended workshops by the Outreach Center of the Center for Middle Eastern Studies at Harvard University. In fact, the Outreach Center's director presented a seminar on Israel/Palestine to Newton South High School in April, 2011. The Center defines its mission as promoting "a critical understanding of the diversity of the Middle East region for educators and the general public." What unsuspecting teachers, parents and students do not realize is that, in reality, the Center espouses the Palestinian cause, providing a narrow partisan perspective, instead of objective, balanced information. The Outreach Center serves as the link between Harvard University's Center for Middle Eastern Studies and surrounding middle and secondary schools. A decade ago, the Center for Middle Eastern Studies received state funding to set up a teacher training seminar on Islamic history. Then too, it displayed a pronounced pro-Islamic, pro-Arab tilt; Massachusetts education officials were shocked by the program the Center presented and denounced it as an attempt to foist a "manipulative" and "distorted" political agenda on unsuspecting teachers. The Center pushed the controversial text book, The Arab World Studies Notebook, which state officials described as "propaganda" and "practically proselytizing." The Notebook included such bizarre assertions as the claim Muslims discovered America before Columbus and Iroquois Indian chiefs had Muslim names. Later editions of The Notebook removed some of the absurd claims, but its fundamental flaws remain. However, the criticism from wary Massachusetts education officials did not deter the Center for Middle Eastern Studies from pursuing its partisan agenda. The Outreach Center plays a crucial role. Although its programs deal with many aspects of the Middle East and has recently focused on the unrest in Egypt, its handling of the Israeli-Palestinian conflict stands out as an example of political bias tainting educational training. Each year the Center runs several multi-day workshops drawing in teachers and students from regional school systems. Its director, Paul Beran, also conducts seminars at both secondary and middle schools. The workshops and seminars provide attendees with recommended reading lists, films and curricular materials. Its association with Harvard University gives the Center the imprimatur of reputable scholarship. In reality, the Center staff and its associates are not distinguished as scholars but some have burnished their credentials as anti-Israel scribes and activists. For instance, Director Beran promotes the Boycott, Divestment and Sanctions (BDS) campaign against Israel. At a Teach-In and Organizing Conference on Dec. 11, 2005 at Harvard, Beran discussed the success of BDS within the Presbyterian Church - PC (USA) - and offered his vision of the BDS movement. Beran advocated "constructing long-term networks of broad based support for action." He boasted of successfully forming a coalition with the radical anti-Israel group, Jewish Voice for Peace. In this way, Beran stated, "it helped the PC (USA) to deal more forcefully with the criticism it has and continues to receive from Zionist groups and their ilk." After the BDS movement failed to gain passage of a divestment resolution in the Boston suburb of Somerville, Beran published a letter in Lebanon's Daily Star newspaper and on a blog called Presbyterians for Justice on Feb. 6, 2006 accusing Israel's supporters of using threats and influence peddling. Charging that "the town mayor, the pension-fund manager and even elected state representatives were all recruited by pro-Israel groups to urge the council to vote 'no,'" Beran opined, "until now, those who acted as if Israel is always right enjoyed a near monopoly over U.S. attitudes." He concluded by asserting, "The first step for divestment campaigns is to have a broad base of cross-community support on which to fall back when the Zionist backlash against the campaigns commences." In a letter, still available on the internet, to then acting Harvard President Derek Bok protesting the enrollment of former Israeli Chief of Staff Dan Halutz into a Harvard Business School course in 2007, Beran leveled defamatory accusations. He wrote, "Mr. Halutz is a noted war criminal, responsible for the deaths of over 1000 Lebanese civilians during the Lebanon-Israel War of the Summer of 2006." In fact, Halutz has not been tried or found guilty of any war crimes. This is the rhetoric of an extreme detractor, not the measured words of an objective educator. Also indicative of Beran's extreme views was a speech to parishioners at the Clarendon Presbyterian Church in Somerville. He compared "the military occupation of Israel over the West Bank, Gaza Strip and East Jerusalem ... to the Roman occupation of Jews nearly 2000 years ago," and asked "How would Joseph and Mary get to Bethlehem with the now 25 foot high Separation Wall in their way?" Beran has also appeared with his wife Hilary Rantisi, who serves as director of the Middle East Initiative at the Harvard Kennedy School of Government. Rantisi has been active with Sabeel Ecumenical Liberation Theology Center, a radical Palestinian Christian group that uses religious imagery to demonize Jews and sponsors gatherings of anti-Israel figures, some of whom compare Israelis to Nazis. At an event sponsored by Friends of Sabeel at the First Church in Salem on May 7, 2005, Beran described the suffering of Palestinian Arab refugees. When queried about Jewish refugees from Arab lands, he incorrectly explained, "Yes, there were Jewish refugees, but they weren't on the same scale." Yet the number of Jewish refugees from Arab and Muslim states exceeded the number of Palestinian refugees. A review of the resources favored by the Center's workshops and courses reveals pervasive bias. The syllabus for Introduction to Middle East politics includes a reading list prominently featuring anti-Israel material. There is Joe Sacco's Palestine, which contains graphic and inflammatory anti-Israel cartoons. Deceased professor Edward Said's, Reflections on Exile and Other Essays is also featured. In light of Said's unremitting hostility to and biased commentary on the Jewish state, one might expect equal prominence would be given to a work by a leading Zionist thinker to provide balance. But instead, ignoring numerous distinguished Israeli historians, the Center commends the work of discredited expatriate Israeli professor Ilan Pappe who has been discredited for his shoddy scholarship, including inventing a quote he attributed to Israeli leader David Ben-Gurion calling for the removal of Arabs from the land. Other Israelis whose works are recommended, such as Avi Schlaim and filmmakers Yoav Shamir and Yuli Gerstel are similarly notorious for denigrating Israel. To gauge how distorted the perspective provided by the Center is in relying on Jewish defamers of Israel, it is important to note that recent polls of the American Jewish community confirm that over 90 percent of Jews strongly support Israel and reject anti-Zionist positions. Yet the recommended reading list heavily favors anti-Zionist Jewish authors. Supporters of Israel and Zionism are nearly invisible. 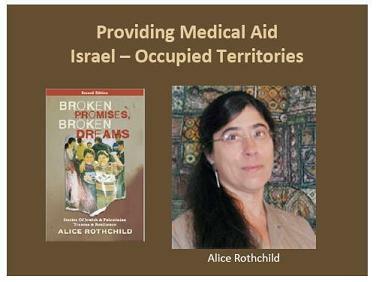 A Power Point presentation for an Outreach workshop in August, 2011 steered teachers from several local schools to writings by Alice Rothchild a local activist with the fringe anti-Israel group, Jewish Voice for Peace (JVP) and to the writings of another JVP member named Sara Glidden. JVP is so radical that even J Street, known for accommodating Palestinian demands, publicly distanced itself from the group. The Anti-Defamation League (ADL) characterized JVP as one of the nation's leading anti-Israel organizations. The ADL said of the group, "While JVP's activists try to portray themselves as Jewish critics of Israel, their ideology is nothing but a complete rejection of Israel." The anti-Israel propaganda film Occupation 101 is among a list of recommended films casting Israel in an unfavorable light. It features a who's-who of Israel's most extreme detractors and delegitimizers, like Richard Falk and Noam Chomsky. The film promotes the odious comparison of Israel to Apartheid South Africa and is saturated with anti-Jewish imagery. A PowerPoint presentation labeled "Teaching Sense Making Around Israel/Palestine" for the Center's Contemporary Middle East Workshop – available on its Web site under teaching resources – encapsulates the Center's counter-factual approach and tone. 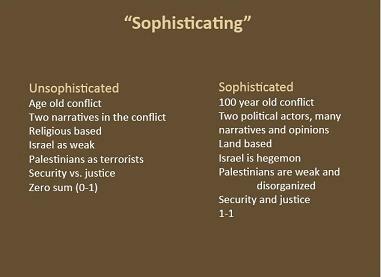 A slide titled "Sophisticating" dismisses as "unsophisticated" a traditional scholarship-based understanding of the conflict, instead substituting a politicized point of view. The religious dimension of the conflict is designated as "unsophisticated," discounting a century of documented Palestinian religiously-driven rejectionism. The dominant Palestinian Arab figure in the first half of the twentieth century was Haj Amin al-Husseini, who held the religious title of Mufti. For him, the religious element was central. His ideology continues today in the guise of the Islamist Hamas movement which justifies its claim to all of Palestine as an irrevocable "Islamic trust." Even the supposedly secular Fatah-dominated West Bank government has repeatedly rejected any consideration of recognizing Israel as a Jewish state as recently as 2010 and 2011 in statements by its Party congress and President Mahmoud Abbas. Apparently this is all "unsophisticated." In the Center's "sophisticated" view the conflict is reduced to a battle over land boundaries. Also deemed "unsophisticated" is the notion of "Palestinians as terrorists." No one views all Palestinians as terrorists, but to ignore the role Palestinian terrorism has played in the conflict is to engage in willful blindness. The slide labeled "Cores of the Conflict" illustrates a recurring theme of Beran's. He consistently ignores Israel's interests. The slide lists only items relevant to Palestinian demands. Missing are key Israeli demands, such as recognition of Israel as a Jewish state and an end to terrorism and incitement to hate. There are subtle deceptions too. Note how color is used to portray the chronological diminishment of land not controlled by Israel leaving the visual impression that the land was taken from the Palestinians by Israel. Another slide labels Israel as a "hegemon," denying that it could be viewed as "weak" (a.k.a. the underdog). Yet the most cursory examination of maps and population data in any World Atlas reveals that Israel faces an environment dominated by Arab and Muslim states whose populations outnumber it by 400 million to 8 million and who possess land area a thousand times greater. A slide purporting to explain U.S. policy reveals another theme running through Beran's teachings – American foreign policy as an instrument of Israeli power. One item on the slide claims that U.S. policy aspires to "Maintain Israel as a hegemon." The United States provides Israel with $3 billion in annual aid and supports Israel at the UN where the Jewish state is isolated. 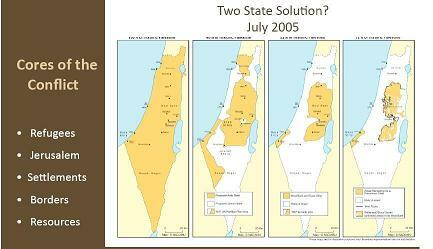 Apparently this support is construed as evidence of Israel dominating the region. The political and economic exclusion of Israel in the region reveals the absurdity of such an interpretation. Even when facts are provided, misrepresentation is implicit in how they are presented. A slide comparing the number of Israelis and Palestinians victims between Sept. 2000 and Dec. 2008 shows more Palestinian minors killed than Israeli minors. These figures shown without context suggest disproportionate Israeli violence compared to Palestinian. But this equation ignores a crucial distinction; Palestinian terrorists target Israeli civilians with indiscriminate rockets and suicide bombers, while Palestinian civilians are the unintended victims of Israeli military strikes targeting terrorists who insinuate themselves within civilian areas. All loss of life is tragic, but this crucial distinction pertains not only to Israel but to American and European operations in Iraq, Afghanistan and Pakistan as well, where collateral civilian casualties frequently occur. The anti-Israel advocacy of the Harvard Outreach Center does not take place in isolation from its parent Harvard University's Center for Middle East Studies. The University was the beneficiary of a $20 million gift by Saudi businessman Alwaleed Bin Talal in 2005. The Middle East Studies Center staff boasts an in-house anti-Israel activist named Sara Roy, of whom Middle East scholar Martin Kramer said in 2009, "Her current project is the whitewashing of Hamas." Another extremist detractor of Israel, Marc Ellis, was also associated with the Center and was recently invited back to give a lecture. A review of the Center's invited lecturers and authors reveals a persistent pattern of favoritism towards Israel's detractors. What is clear is that the Outreach Center is not a reliable purveyor of objective information on the Middle East and in particular, the Israeli-Palestinian conflict. At a time when schools are forced to streamline their budgets, sending teachers to ideologically-tainted workshops or introducing curricula of questionable content does not reflect a responsible use of funds. School systems that choose to utilize the resources of the Outreach Center and its parent Center for Middle East Studies need to be made aware that their teachers are receiving incomplete and unscholarly information. Parents of schoolchildren should ask their school administrators and school board members what policies and procedures have been put in place to prevent the abuse of taxpayer-supported professional development or the purchase of propaganda disguised as curriculum material. Parents need to feel confident that their children are being taught Middle East and Islamic culture and history from credible scholarly sources not demogogues. Harvard, itself, needs to question why it is an accomplice to disseminating propaganda instead of scholarship in its educational outreach activities. Where are Harvard administration, faculty and alumni who care enough about objective scholarship and about the school's integrity and reputation to halt the abuses of the Center for Middle Eastern Studies?